Trent Nelson | The Salt Lake Tribune Young Women General President Bonnie Oscarson speaks at the LDS General Women's Meeting at the Conference Center in Salt Lake City, Saturday, March 29, 2014. Latter-day Saint women have come a long way, according to University of Utah history professor Colleen McDannell. 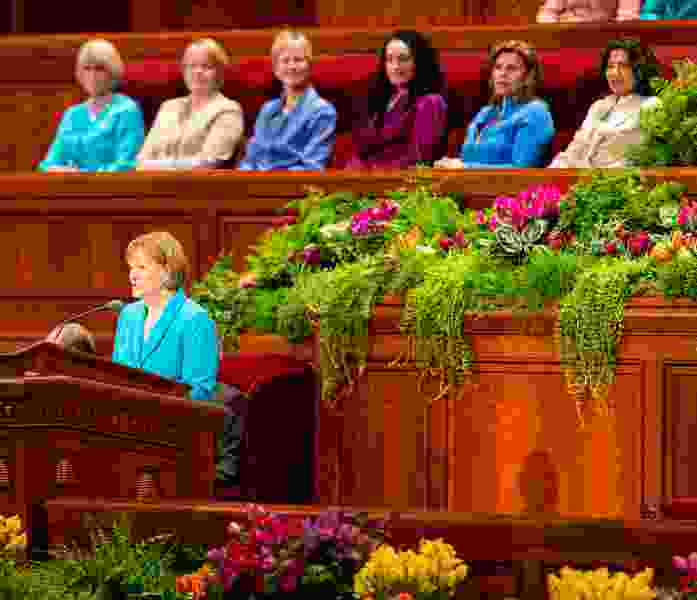 Latter-day Saint women, McDannell says, have made the transition to the 21st century with considerable strength and agency — and even find power in some unexpected ways (like fighting against the Equal Rights Amendment, ironically). I hope the book gets a wide readership. It’s not only carefully researched but also accessibly written, which is frankly not something I can say about a lot of academic books. It’s filled with compelling stories and “wait, what?” bits of historical detail. You could actually give this to your Relief Society president for Christmas — and I hope you will. So up until the 1980s in Mormonism, there were condemnations from church authorities about birth control and small family sizes. But the language in the handbooks gradually becomes softer. And then, in 1998, the church removes those harsh restrictions and basically says, “This is a decision between the couple and God.” And it explicitly says it’s no one else’s business. So you shift instead to the family and don’t focus so much on women in particular. It opens up a lot of spaces. Women can create a nurturing world that fits whatever model they think is nurturing. If that means staying home and saving money by making all your own clothes, that’s one way. If it means that you have your children in day care and you get takeout on the way home because you can play with the kids instead of cooking, that’s another way. The content of how you nurture becomes less important than that you do it.